Sunday, we meet again! Am I the only one who always feels like the weekends are too short?! This balloon sleeve sweater and I are new best friends! I went shopping with a girlfriend of mine last week, and couldn't resist that gorgeous bright red color! I mean, hello Christmas! Up until two days ago, it was actually still 70 degrees here during the day, so I paired it with these $50 faux leather shorts for an edgier look! I'm obssessed with the sleeves on it, and love that it's semi oversized making it perfect to wear with skinny jeans. I actually ended up wearing it on my birthday with these black skinnies and a statement belt because it was too cold for the shorts, and got tons of compliments on the whole outfit! 1. Fresh Skincare Cult Classics, $19.50 // I get asked about my skincare routine all.the.time. - and while it's very minimal, the Fresh Soy Cleanser is something I can't live without. I actually got to try it out as my birthday gift from Sephora last year, and have been hooked ever since. This cleanser sooths and softens my skin while keeping it hydrated and well.. looking "fresh." The set also comes with the Sugar Lip Treatment Advanced Therapy which I haven't tried yet, but have been wanting too as it's an age defying lip treatment that's supposed to enhance volume and smooth the look of wrinkles. I use the regular Sugar Lip Treatment daily in the winter and love it, so I'm sure I won't be disappointed. Plus, who can beat both for $19.50? 2. Smashbox Travel Primer Set, $22 // This is a trio of face primers to visibly blur pores and defeat shine. Aka, you need it. I've been using the photo finish for years now! I will say, I don't use it daily as my makeup regimen for work has become minimal. However, if I'm putting a little more effort into my makeup, or shooting outfits for the blog - I don't leave the house without it on. If you have shiny skin, this is great to help reduce that oily look. 3. Fresh Lip Caramel, $18 // The leaves change, skin starts getting dry, and next thing you know - you're lips are crying for help. This stuff is like buttery rich goodness! If you suffer from cracked lips during the winter, you won't be disappointed with this. It keeps your lips moisturized for 24 hours and with no sticky residue, too. 4. Tartelette Toasted Eyeshadow Palette, $46 // This palette nails it in terms of warm and cozy shades. Hello, me! I'm typically a Smashbox/MAC eye shadow girl, but the second I saw this palette I knew it was good. 5. Tarte Limited Edition Posh Pout Quick Dry & Glossy Lip Set, $36 // I was sorely disappointed when I found out BareMinerals discontinued their Marvelous Moxie line this year as they were my go to for a good gloss. So, I've been on the hunt for something comparable and Tarte keeps coming up as a great reccomendation. I actually didn't buy the entire set as I'd like to try it first, but 8 glosses for $36 is a killer deal. I took home a single gloss to try, and if I like it i'll likely come back for the set! Phew, there are so many amazing options and definitely a few I added to my wish list as well (see here, and here), but that's a round up of some of my favorites! If you're looking for additional gift options under $50 click here. Shane and I went to Clemson this weekend for the Clemson vs. Florida State game with another couple we are friends with and my sister! I always love going back to my alma mater and reliving my younger days. Sometimes I wish I could do those four years all over again! There's just nothing quite like Clemson on game day. Anyway, I'm writing this from my bed, with the tree lights twinkling in the background, and a christmas movie on -- so duty calls! 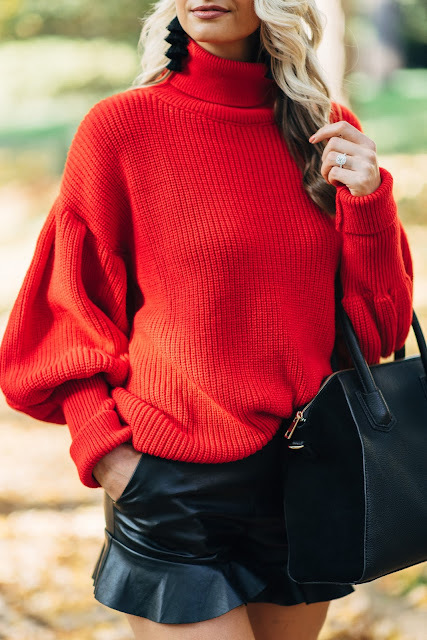 This red color of sweaters look great with skirts. I like your boots. If you are looking for this type of amazing vintage clothes and thinking to get fur wholesale then, visit PalsGrossisten.